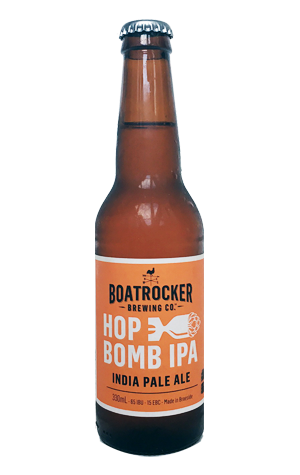 Long before they finally opened their own brewery, Matt and Andrea Houghton planned to add an IPA to the Boatrocker lineup. They even bounced one name, "Blind Freddy", off us at one point, a name that even we thought might be a little risky for the powers-that-be. In the end, an IPA became one of the first new beers to be brewed at their Braeside home and earned the title Hop Bomb. It's a moniker they attached to a beer based around New World hops, many of them introduced to the beer late on via Boatrocker's customised hop back. There's a sturdy malt backbone lending the beer its copper colour and keeping the 60-plus IBUs of bitterness from becoming overly obtrusive. Having flitted around between being a seasonal and core range beer for a while, during late summer 2018, they brought it back into the year round lineup, seemingly making it a little leaner and upping the dry-hopping to add an extra lick of citrusy, pineapple characters.